Any Quizzo fans out there? 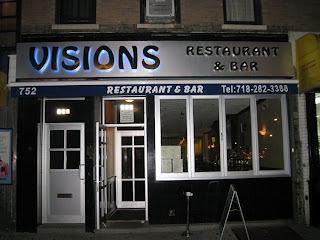 A fortnightly pub trivia event kicks off tomorrow night (12/4) at 9pm sharp at Visions Bar & Restaurant, near the corner of Coney Island and Cortelyou. Come alone to meet people or come with a couple friends and play as a team. General knowledge questions will be pop-cultural as well as scholarly, so everyone can contribute something to a team. As veterans of many bar trivia nights, we challenge each and every one of you to come out and prove your worth for the chance at no less than a $50 gift certificate and a round of polite applause for the winners. The flyer I'm seeing here also says half-price beers and select apps for the duration of the game, so it shouldn't put too much of a dent in the old wallet. Also, if you've been looking for a good burger in Kensington, this is your place. Manny (the Monday bartender) tipped us off to this fine slab of Salisbury and I haven't stopped thinking about it all week. Our brains are booked for Pete's Candy Store tonight, but I think we'll have something left in the tank for any and all local challengers.